Bronchoscopy is a test to view the airways and diagnose lung disease. It may also be used during the treatment of some lung conditions. 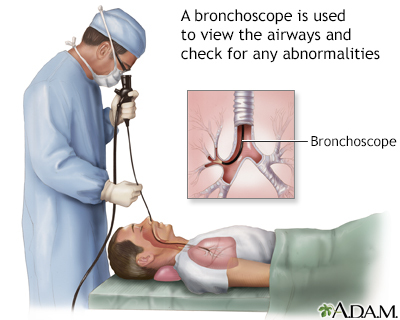 A bronchoscope is a device used to see the inside of the airways and lungs. The scope can be flexible or rigid. A flexible scope is almost always used. It is a tube less than one half inch (1 centimeter) wide and about 2 feet (60 centimeters) long. 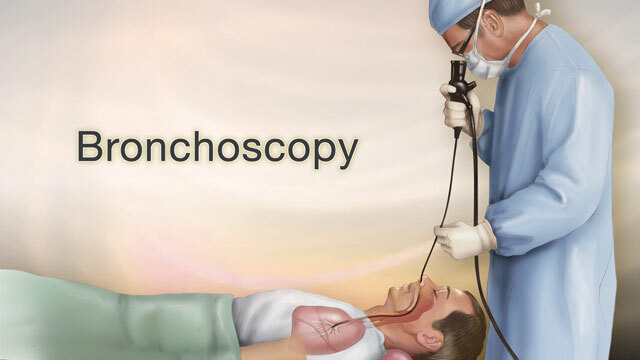 In rare cases, a rigid bronchoscope is used. You will likely get medicines through a vein (IV, or intravenously) to help you relax. Or, you may be asleep under general anesthesia, especially if a rigid scope is used. A numbing drug (anesthetic) will be sprayed in your mouth and throat. If bronchoscopy is done through your nose, numbing jelly will be placed in the nostril the tube goes through. The scope is gently inserted. It will likely make you cough at first. The coughing will stop as the numbing drug begins to work. Your health care provider may send saline solution through the tube. This washes the lungs and allows your provider to collect samples of lung cells, fluids, microbes and other materials inside the air sacs. This part of the procedure is called a lavage. Sometimes, tiny brushes, needles, or forceps may be passed through the bronchoscope to take very small tissue samples (biopsies) from your lungs. Your provider can also place a stent in your airway or view your lungs with ultrasound during the procedure. A stent is a small tube-like medical device. Ultrasound is a painless imaging method that allows your provider to see inside your body. Sometimes ultrasound is used to see the lymph nodes and tissues around your airways. At the end of the procedure, the scope is removed. Not to eat or drink anything for 6 to 12 hours before your test. Not to take aspirin, ibuprofen, or other blood-thinning drugs before your procedure. Ask the provider who will do your bronchoscopy when to stop taking these drugs. Arrange for a ride to and from the hospital. Arrange for help with work, child care, or other tasks, as you will likely need to rest the next day. Usually, the test is done as an outpatient procedure and you will go home the same day. Some people may need to stay overnight in the hospital. Local anesthetic is used to relax and numb your throat muscles. Until this medicine begins to work, you may feel fluid running down the back of your throat. This may cause you to cough or gag. Once the medicine takes effect, you may feel pressure or mild tugging as the tube moves through your windpipe. Although you may feel like you are not able to breathe when the tube is in your throat, there is no risk of this happening. The medicines you receive to relax will help with these symptoms. You will likely forget most of the procedure. When the anesthetic wears off, your throat may be scratchy for several days. After the test, your ability to cough (cough reflex) will return in 1 to 2 hours. You will not be allowed to eat or drink until your cough reflex returns. You may have a bronchoscopy to help your provider diagnose lung problems. Your provider will be able to inspect your airways or take a biopsy sample. An imaging test showed abnormal changes of your lung, such as a growth or tumor, changes or scarring of lung tissue, or collapse of one area of your lung. To biopsy lymph nodes near your lungs. To see why you are coughing up blood. To explain shortness of breath or low oxygen levels. To see if there is a foreign object in your airway. You have a cough that has lasted more than 3 months without any clear cause. You have an infection in your lungs and major airways (bronchi) that cannot be diagnosed any other way or need a certain type of diagnosis. You inhaled a toxic gas or chemical. To see if a lung rejection after a lung transplant is occurring. Normal results mean normal cells and fluids are found. No foreign substances or blockages are seen. Infections from bacteria, viruses, fungi, parasites, or tuberculosis. Lung damage related to allergic-type reactions. Lung disorders in which the deep lung tissues become inflamed due to the immune system response, and then damaged. For example, changes from sarcoidosis or rheumatoid arthritis may be found. Lung cancer, or cancer in the area between the lungs. Narrowing (stenosis) of the trachea or bronchi. Acute rejection after a lung transplant. Kraft M. Approach to the patient with respiratory disease. In: Goldman L, Schafer AI, eds. Goldman-Cecil Medicine. 25th ed. Philadelphia, PA: Elsevier Saunders; 2016:chap 83. Kupeli E, Feller-Kopman D, Mehta AC. Diagnostic bronchoscopy. In: Broaddus VC, Mason RJ, Ernst JD, et al, eds. Murray and Nadel's Textbook of Respiratory Medicine. 6th ed. Philadelphia, PA: Elsevier Saunders; 2016:chap 22. Scanlon PD. Respiratory function: mechanisms and testing. In: Goldman L, Schafer AI, eds. Goldman-Cecil Medicine. 25th ed. Philadelphia, PA: Elsevier Saunders; 2016:chap 85. Reviewed By: Denis Hadjiliadis, MD, MHS, Paul F. Harron, Jr. Associate Professor of Medicine, Pulmonary, Allergy, and Critical Care, Perelman School of Medicine, University of Pennsylvania, Philadelphia, PA. Also reviewed by David Zieve, MD, MHA, Medical Director, Brenda Conaway, Editorial Director, and the A.D.A.M. Editorial team.